We all have our favorite pianos such as the Steinway and Kimball. But how does Kimball compete with a brand like Steinway in terms of their marketing? Simple, they pull an awesome stunt like they did during last years super bowl. 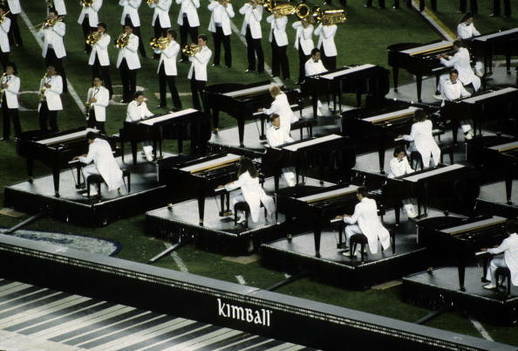 In a spectacular promotional event, Kimball International placed 88 grand pianos on the field at Jack Murphy Stadium in San Diego for the halftime show of Super Bowl XXII. The pianos were on stage for a full 12 minutes and were viewed by a television audience of over 90 million. The show was fittingly dubbed “Something Grand,” and featured a performance of the Grieg Piano Concerto accompanied by the famed Radio City Music Hall Rockettes. “It was an unparalleled opportunity to promote the piano and the Kimball brand,” said a spokesman. We were not a part of those piano moves but I could imagine that they needed a FLEET of piano movers to actually move all of those. I mean that’s pretty incredible. Next time, Piano Movers HQ in San Diego is going to have to grab a contract with Kimball to help them move all their pianos!